Tagline By night, it's all you need to wear. Package Designer Silhoutte bottle topped with black faceted cap. 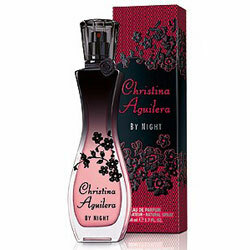 "Christina Aguilera By Night captures glamour and elegance through its design, color and scent. Focusing on Christina's favorite color -red, the fragrance evokes her unique, ultra-feminine style."